Denmark, 1960s Designed by Henry Rosengren Hansen for Brande Møbelindustri, this gorgeous six-legged sideboard features an eye-catching rosewood grain. 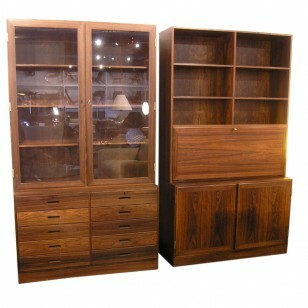 It offers plentiful storage, with five drawers and movable shelving behind three doors with carved handles. United States, 1960s Milo Baughman created this 1960s case sofa for Forecast Furniture. Two gorgeous panels of Brazilian rosewood frame the upholstered seat and give the piece the clean lines typical of the designer’s work. Denmark, 1960s Designed by Arne Vodder and manufactured by Sibast, these armchairs, model #341, feature solid rosewood frames with black leather upholstery. 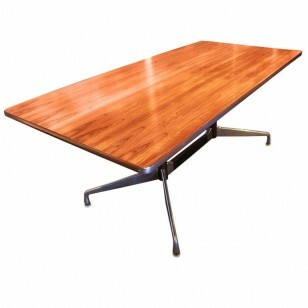 Denmark, 1960s This beautiful dining table features a simple design and rich rosewood grain. The table includes two leaves that rest on supports that pull-out from the sides of the table, thus allowing the top to be seamless. Denmark, 1960s These high-back armchairs were designed by Arne Vodder and manufactured by Sibast. They are constructed of solid rosewood and feature seats that have been reupholstered in Maharam’s Hallingdal wool textile in color 590. USA, 1970s A beautiful example of the iconic Eames lounge chair and ottoman, this chair features the classic rosewood veneer and black leather. Ottoman measures 26″ W x 22″ D x 16″ H.
Denmark, 1970s This table features a beautiful rosewood grain and has 2 matching 19.75″ leaves (only one is shown). With both leaves installed the table measures 103.5″ long. USA, 1970s This Milo Baughman sideboard is constructed of a walnut case with rosewood doors and Lucite ends, which give the illusion that the sideboard is floating. It features six doors that house ample storage, including two felt-lined flatware drawers. 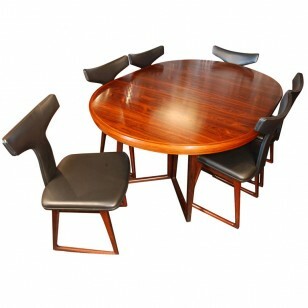 Denmark, 1960s This round dining table was designed by Arne Vodder. It is constructed of rosewood and features one 19.5″ leaf that allows it to extend to 68.5″. 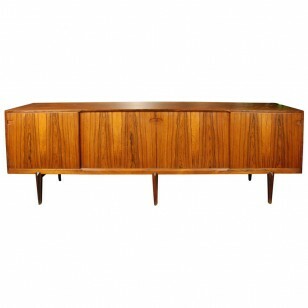 Denmark, 1960s This rosewood sideboard has ample storage and stunning grain. It features four drawers and four sliding doors, which open to reveal adjustable shelving and additional drawers. USA, 1960s This secretaire desk was designed by Ib Kofod-Larsen and manufactured in Denmark. It features six large bottom drawers, four smaller drawers, and a locked secretaire cabinet that houses additional storage and provides access to hidden storage. Denmark, 1960s This set of six dining chairs by Niels Moller is composed of solid rosewood, ladder-back frames with seats that feature the original vintage upholstery. Denmark, 1960s Beautiful rosewood sideboard by Kai Kristiansen with aluminum inlay and aluminum feet. This piece has four drawers and two storage areas, each with adjustable shelving. USA, 1960s This pair of LCM lounge chairs by Eames for Herman Miller is constructed of rare rosewood that showcases the stunning grain of the wood. 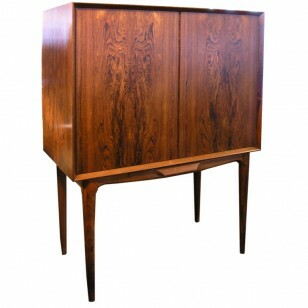 Denmark, 1960s This sideboard, designed by Kofod Larsen, is constructed of beautiful rosewood. Its four drawer, with vertical rosewood drawer pulls, open to reveal two shallow cutlery drawers and seven shelves. 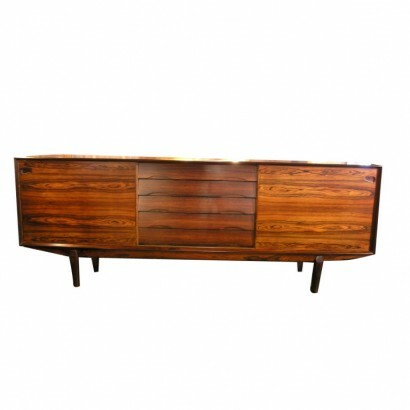 Denmark, 1960s This sideboard features stunning rosewood grain and impressive storage. Its four doors with recessed handles open to reveal adjustable shelving and four felt-lined drawers. Denmark, 1950s This stately sideboard by Hans Wegner is composed of a rosewood exterior with sliding rosewood tambour doors, an oak interior, and tapered rosewood legs. The interior features numerous drawers and shelves for ample storage. Denmark, 1960s These dining chairs by Harry Ostergaard feature exceptional clean lines and are constructed of solid rosewood with upholstered seats. Denmark, 1960s This rocking chair by Arne Vodder is composed of solid rosewood and features and newly reupholstered seat cushion. Denmark, 1950s This chair, designed in 1949 and known as the Colonial chair, was inspired by Ole Wanscher’s interest in 18th century English furniture. This example is composed of solid rosewood with black leather cushions. Denmark, 1960s This simple coffee table by Arne Jacobsen features a beautifully grained round rosewood top that sits atop a steel pedestal base. Denmark, 1950s This stately sideboard by Hans Wegner is composed of a rosewood exterior with sliding rosewood tambour doors, an oak interior, and geometric steel legs. The interior features numerous drawers and shelves for ample storage. Denmark, 1960s This set of six chairs by Harry Ostergaard features crescent-shaped rosewood backs and original upholstered seats. Denmark, 1960s This long coffee table is made of rosewood with stunning grain. It is by Severin Hansen Jr., and it features two pull-out trays that each measure 13.25″ x 19″. Denmark, 1960s This media cabinet by Bang & Olufsen features four compartments with three slide-out shelves, built-in ventilation, and discreet cord channeling. Denmark, 1960s This set of four chairs by Arne Vodder for Sibast features solid rosewood frames with black leather cushioned seats. Denmark, 1960s This chair features a rosewood slat-back frame with striking grain and sculptural legs. It has been newly reupholstered in Knoll textile. Corresponding sofa also available. Denmark, 1960s This sofa features a rosewood slat-back frame with striking grain and sculptural legs. It has been newly reupholstered in Knoll textile. Corresponding lounge chair also available. Denmark, 1960s This drop-leaf dining table features stunning rosewood grain and unique spider-like legs. Each leafs is 24″ wide, and when close the table measures 29″ wide. Denmark, 1960s This comfortable lounge chair features all original textile in a unique windowpane plaid pattern. 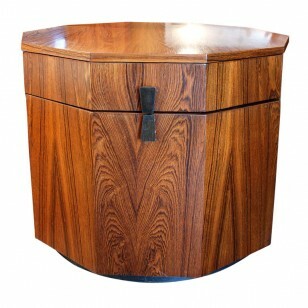 Denmark, 1960s This rosewood bar cart has a bisected black laminate top. Each section slides to reveal an interior with a glass shelf and white laminate sliding partitions. The cart is on square legs with casters. Open length is 53.5″. Denmark, 1960s Beautiful rosewood sideboard by Kai Kristiansen with aluminum inlay and aluminum feet. This piece has four drawers and two storage areas, each with one adjustable shelf. Denmark, 1960s Designed by Finn Juhl for France & Son, this small square coffee or side table from the mid-1960s juxtaposes a beautiful rosewood veneer top with aluminium edges and legs. Denmark, 1960s Designed by H. W. Klein for renowned Danish department store Illums Boligus, this lovely serving cart features a solid rosewood frame with curved edges and a highly practical rosewood-patterned laminate top and lower shelf. USA, 1960′s An early example of the iconic Eames Lounge Chair and Ottoman, this chair features classic black leather and beautiful rosewood veneer. Ottoman measures 26″ W x 22″ D x 16″ H.
USA, 1960′s Classic modern design meets natural beauty in this Action Desk by George Nelson. Its striking rosewood top is trimmed with black rubber and sits atop an aluminum base. The desk features one inconspicuous drawer with two compartments. Denmark, 1950′s This set of six dining chairs by Johannes Andersen are constructed in solid rosewood and feature a simple yet elegant silhouette. The seats are upholstered in moss green suede upholstery that compliments the tone of the rosewood. 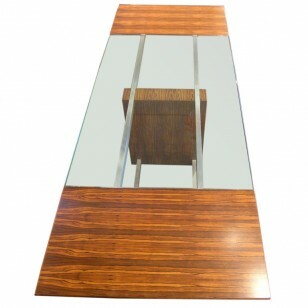 Brazil, 1960s Designed by Brazilian modernist Percival Lafer, this coffee table showcases a variety of exotic woods — rosewood, jacaranda, and mahogany. It is topped with glass and its legs fold inward to facilitate shipping and storage. Denmark, 1950′s Beautiful large sideboard with adjustable shelving and felted drawers. 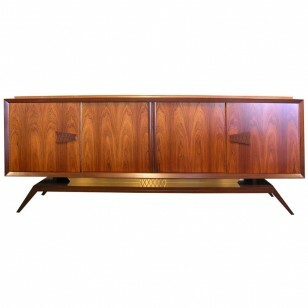 Denmark, 1960′s This beautiful sideboard by Oman Junior boasts a stunning rosewood grain. It features ample inner storage and four felt-lined drawers. 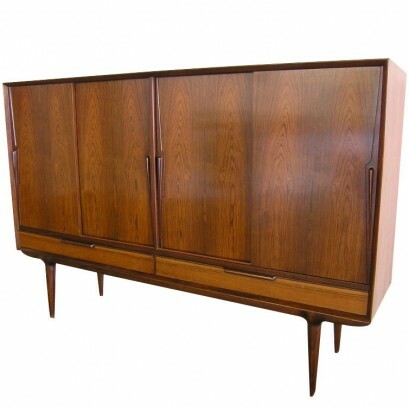 USA, 1970′s This classic Florence Knoll credenza has a spectacular rosewood grain. It features two file drawers and eight smaller drawers that can be customized with inserts to suit a variety of storage needs. Denmark, 1960′s This elevated rosewood cabinet features two sliding doors that house four adjustable cutlery drawers and one area for adjustable shelving. Below the large storage area are four shallow drawers with brass ring drawer pulls. Denmark, 1960′s This large Danish sideboard features six drawers and plentiful interior shelving. Its stunning rosewood grain and elegant drawer pulls make this functional piece stand out in any room. Large Rosewood Buffet/Sideboard by Severin Hansen Jr.
USA, 1970′s This classic Florence Knoll credenza has a spectacular rosewood grain. 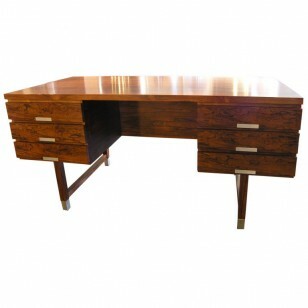 Denmark, 1950′s The beautiful rosewood grain of this desk highlights its elegant design. Six felted drawers on one side and open shelving on the other. Denmark, 1960′s This classic Hans Wegner Papa Bear chair has been expertly reupholstered in Maharam Hallingdal textile. Denmark, 1960′s This impressive mirror is perfect for a foyer, with pegs for keys and pockets for mail. Denmark, 1950′s These lovely chairs are extremely comfortable and elegant. Beautiful rosewood grain. 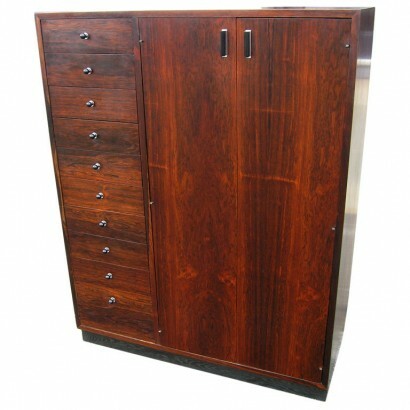 Denmark, 1960′s This elegant rosewood bar cabinet has ample storage space with built in bottle holders, 2 shelves, 2 roomy drawers and 2 removable wine racks. Beautiful rosewood grain. Denmark, 1958 This exquisite dining set features a beautiful rosewood grain. The chairs are considered of the best Danish chairs of their time. Including 2 19″ leaves, one which folds in half and stores under the table. Denmark, 1960′s This sideboard is skillfully crafted with two upper drawers and lower cabinet shelving. The rosewood grain is beautiful. Denmark, 1960′s The beautiful construction of this elegant desk showcases the skilled craftsmanship that the Danish are known for. Dovetaill joints and unique “floating” drawer casings add to the beauty of this design. Denmark, 1960′s Beautiful set of eight dining chairs with original blue wool textile. Denmark, 1960′s This sweet little desk features a sliding out writing tray with a glass insert as well as unique horizontal filing space and two lower drawers. Denmark, 1960′s This set of six dining chairs are upholstered with the original striped wool textile, which is in very good condition. Denmark, 1960′s This set of 6 solid rosewood chairs have the original blue textile, so they are ready to reupholster in the fabric of your choice. USA, 1960′s This elegant rosewood chest has 10 drawers on the left (large bottom drawer) and adjustable shelves on the right. Denmark, 1950′s This beautiful sideboard has four sliding doors which open to reveal adjustable shelves and felt-lined drawers. Two large drawers at the bottom provide additional storage. Denmark, 1960′s Excellent example of Rosengren Hansen design, the detailing and workmanship make this piece a wonderful addition to any room. 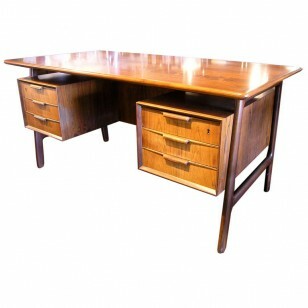 Denmark, 1950′s This rosewood desk has six roomy drawers on one side and two compartments and a storage unit with hinged drop-down door are on the other side. Beautiful craftsmanship is evident throughout. Denmark, 1960′s Rare and beautiful, this rosewood coffee table is in excellent condition. With two magazine slots as well as a center drawer on each side, this elegant table is a timeless piece. Denmark, 1960′s This dining set by Arne Vodder is in excellent condition. The beautiful rosewood table has a unique base and comes with a 19.75″ leaf. Matching set of six T-back chairs newly upholstered in black leather. 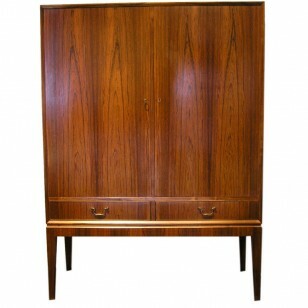 USA, 1960′s This cabinet has a beautiful rosewood grain. It has great storage capacity with a large drawer and a spacious lower compartment. The door has an interior shelf. USA, 1950′s This exquisite rosewood sideboard has an impressive presence. With beautiful grain and details, this piece makes a statement in any environment. It is extremely well-constructed and solidly built. 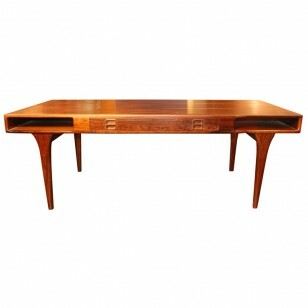 Denmark, 1960′s This stunning desk features a magnificent rosewood grain and inlaid aluminum details. With six roomy drawers and shelving on the other side, this desk is as functional as it is beautiful.